You can make the sauce for the chicken dish with red wine for more punch. A knob of butter whisked in at the end makes it even silkier. Chicken thighs (with the skin on) can be used instead of breasts. In a mortar with a pestle, pound the garlic and thyme. Rub this mixture into the chicken breasts and season generously. Pod the broad beans. Blanch them in boiling salted water for 1 minute, then refresh in iced water and drain. Peel the blanched beans, giving you about 250g of double-peeled beans. Add a splash of oil in a wide, deep pan over medium heat. Place the chicken breasts skin-side down into the pan. Cook slowly until the skin is golden brown then turn over to seal the other side. Remove chicken from pan and drain off any excess fat. Melt half the butter in the pan then add the lettuce. Brown on both sides and remove. Place the sliced eschalots into the pan and cook for 5 minutes. Add the speck and continue to cook until golden. Add the wine and increase heat to high, scraping the base of the pan, then reduce for a minute. Add stock and return chicken to pan, skin-side up. Simmer over a medium heat for about 20-25 minutes, or until chicken is cooked. In the final five minutes before the chicken is cooked, add the lettuce, cover and continue to simmer until the lettuce is braised but still holding its shape. Remove the chicken and lettuce from the braising liquid and keep warm. Add the remaining butter then cook the sauce over a high heat until reduced and glossy. Just before serving, warm the broad beans in the sauce. 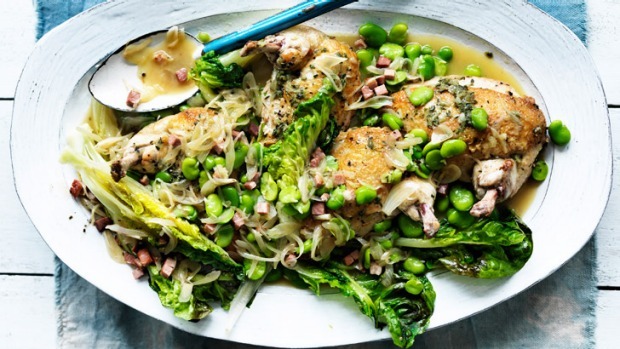 Serve the chicken breast on the braised lettuce with the broad beans and sauce poured over the top.